I bring this up because it not only conjures up the true feeling of a stifling hot summer day in an urban jungle but because when James and I went to Williamsburg to revisit my childhood, New York City had begun the biggest heat wave it had known in years and it was precisely how the two of us felt. I was unable to get the song (which by the way, Rolling Stone Magazine ranked #401 of the 500 greatest songs of all time) out of my head. Needless to say that as a coupe of overweight, out of shape, middle-aged men suffering from a number of ailments not the least of which is high blood pressure, we were uncomfortable to say the least. That said, there was still a very important place for me to revisit. In 1938, my grandfather Vito Abate, built an incredible grotto on the grounds of his local parish church, Saint Francis of Paola. Yes I know that this is the third church I mentioned in as many blogs, but there ARE that many Catholic churches in the area. It seems as though you stumble across another one every few blocks or so. The remarkable thing is, as a child, every one of them was packed full for each and every mass! Anyway, I digress… I knew that I absolutely had to take James to see my grandfather’s work no matter how oppressive the heat. 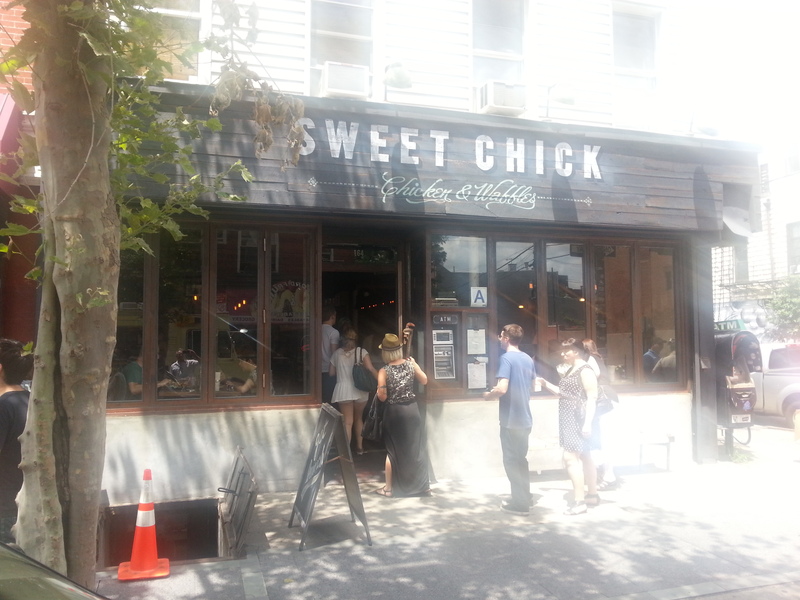 After stopping off (even further north on Bedford Avenue) we took a break to cool off and grab a bite to eat. 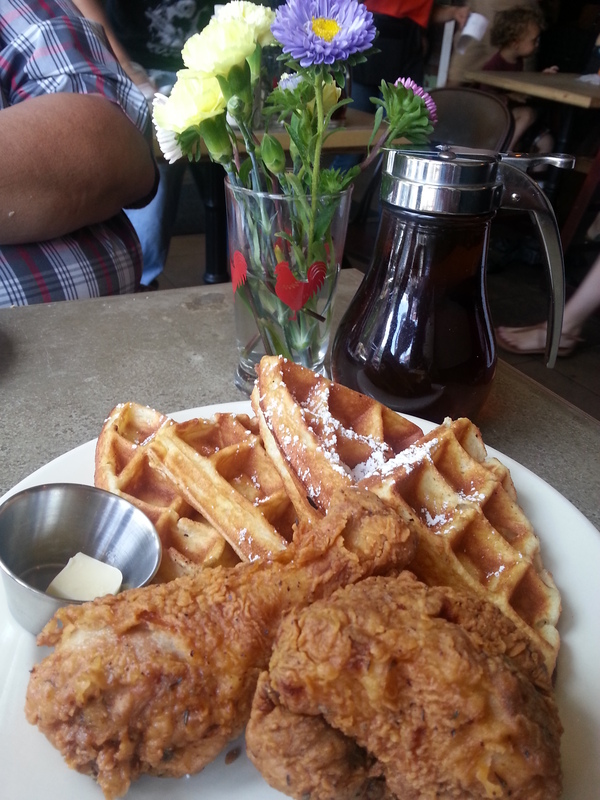 We found a cute little place called, “Sweet Chick” that is known for their chicken & waffles. Outside the shop sat one of the famous food-trucks “Van Leeuwen’s Ice Cream” that was preparing for what was sure to be a huge crunch on this big feast day. After taking some time to share a scone, a couple of tall iced teas, and of course some chicken and waffles, we were ready to do an about face and head south to Conselyea Street, where St. Francis church is located. As a child I remember passing by the structure thinking “oh, that’s grandpa’s grotto,” but because I was only a child, I was unable to truly appreciate the craftsmanship or the incredible hard labor of love it took to complete the task. Please allow me to tell you about my grandpa. Vito’s greatest loss came in 1938, after the death of his youngest daughter, Anna who passed away from pneumonia at age eight. Heartbroken, he decided to build a grotto at his local parish church, Saint Francis of Paola, as an offering to the Virgin Mary in hopes that she may look after the daughter he could no longer care for himself. A poor and unhealthy man, Vito would walk from his apartment in Williamsburg, over the Manhattan bridge to Canal Street and through the Holland Tunnel to New Jersey, where he would collect the stones that were being discarded there during work on the tunnels. Hunched over his little wooden wheelbarrow, he hauled 6-8 stones at a time back to Brooklyn to be used to erect the structure. I can’t even imagine how much his back ached from the journey or the countless miles he logged, gathering the hundreds of stones needed to complete his beautiful grotto. 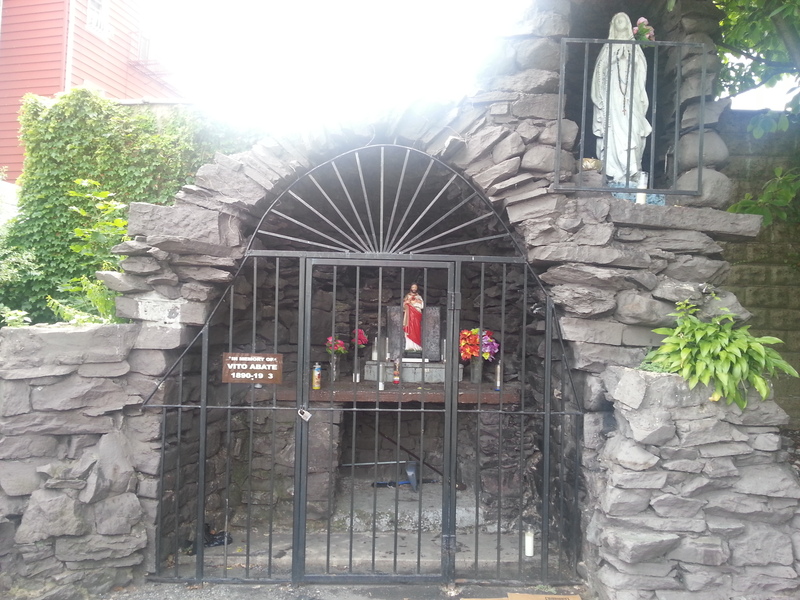 This grotto was erected out of a father’s undying love for his daughter and has been standing as a testament to his incredible faith for over 75 years. I was fortunate, honored, and above all, blessed enough to call Vito Abate my grandfather and I could not be more proud – or more humbled – by such an inspirational and devoted man. God bless you grandpa, I love you. I get hungry just looking at the photos!! Great story, the Grotto is amazing. Hi, my father was born and raised on Humboldt St (between Withers and Frost). He also owned Buonomo Cleaners on the corner of Withers and Humboldt Sts. I went to St, Francis of Paola School until the 3rd grade when we moved to Staten Island. St. Francis of Paola is a saint from Calabria; however, most of the immigrants that attended St. Francis of Paola Church were from various towns in Salerno (ie. Teggiano, Sanza, etc…) I don’t know who the founding Pastor was. Thank you Doreen for your information. As a child I never actually attended St. Francis. If you go back one or two blogs from this one, you will learn that my father passed away when I was a small child and my mom later married the man who is my dad, John Abate. Before they were wed, we lived on Metropolitan and Union Avenue and attended Our Lady of Mt. Carmel. Once mom & dad married, we left the neighborhood but returned afters my brother’s death and lived on Engert Avenue for two years, where we attended Saint Cecilia. After that we, left the neighborhood or good, only returning to visit family. I find it odd now to think that we didn’t walk the few extra blocks to go to my Grandpa’s church, if only to say a prayer each Sunday at his beautiful Grotto. If you lived there your whole life, and I don;t know your age, you might have known my Aunt Millie’s candy store in Graham Avenue from the 70’s -80’s. My Grandma (Maria Abate) often worked behind the counter there. I am so pleased that you read this Blog about my wonderful Grandpa. I wonder what led you to it? How you came upon it? I guess it was fate. In any case, thank you for your kind words.